Norwegian researchers are trying to help avoid a collision in the industrial workplace by developing a series of algorithms that make the robot arm adapted to objects moving in a matter of milliseconds. A team at the independent research organization called SINTEF in Norway combines an industrial robot arm with existing 3D sensor helps the robot to detect objects around him. This sensor sends the data to a computer that processes the data and the information was then sent back to the robot arm that move quickly if it is to be on a collision course. According to the SINTEF team, along with the existed industrial robots which usually have a weighs several tons and is usually in the annex networking, calculating the movement updates can take a matter of seconds. 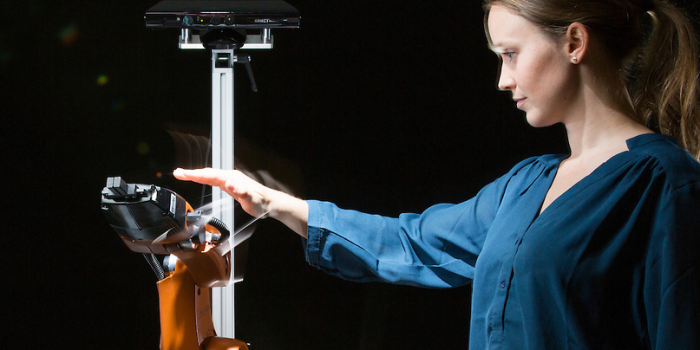 As demonstrated the teamwork, Øystein Hov Holhjem, a SINTEF researcher put the arm on the side of a sensitive robot arm and turns the robot was moving slowly in the other direction. "I can put my hand here and the robot will react quickly," as he told to Reuters in a robot's skill performance. "This robot can plan a new route of the current position along the direction in less than 20 milliseconds."